Naked on Pluto — by Dave Griffiths, Aymeric Mansoux and Marloes de Valk — is the winner of VIDA 13.2, the prestigious international art and artificial life contest. 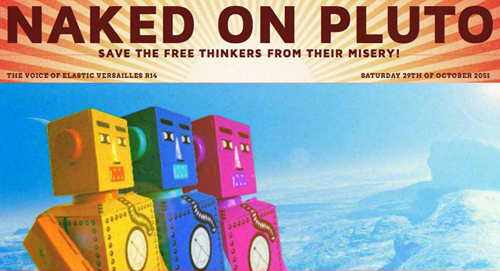 Naked on Pluto proposes a playful yet disturbing online game world, developed with Free/ Libre Open Source Software, which parodies the insidiously invasive traits of much “social software”. The city of “Elastic Versailles” is animated by the quirky combinatorial logics of a community of fifty seven AI bots that glean Facebook data from subscribers to the game. Naked on Pluto’s bot crew, which are hard to distinguish from other agents in this text-based environment, are dysfunctional gatekeepers whose access-control means are broken by the participants only to be elastically “healed” by the bots. Players attempt to override the game’s restrictions, teaming up in order to ultimately crash and escape from the system. Reporting on activities via a blog and Twitter, and issuing a constant stream of incitations to click, declare, poke and buy, the bots run havoc with one’s own and one’s friends’ data, generating more or less spurious links with chillingly escalating speed. Disconcertingly familiar faces and information from one’s personal and associated profiles are indiscriminately blended in a brash prosumer landscape which, like the original Versailles, is designed for promotional parades of inseparable personal and ideological attributes. No player information is shared, stored, or relayed back to Facebook in this malleable social ecosystem where all that counts are glimpses of fleeting visibility. Naked on Pluto caricatures the proliferation of virtual agents that harvest our personal data to insidiously reshape our online environments and profiles, highlighting the ambivalent hallmarks of major social networks: friends as quantifiable and commodifiable online assets, personas carefully fashioned contrived to impart a sense of “intimacy”, and disingenuous publishing of “private” data as self-advertising. The emergence of intelligence in this game is ultimately, hopefully, that of the players who manage to escape from it. The VIDA Awards were created by Fundación Telefónica in 1999 to promote artistic creation based on new technologies and artificial life. A total of 198 projects from 36 countries entered into contest in this edition. The works will be showcased at Fundación Telefónica?s stand in ARCO 2012.